ACT Forklift: Sweep, Scrub, or Both? There are many variables to consider when determining the correct scrubber / sweeper for a specific application. We attempt to determine the “level of clean” the customer desires. We also review the current facility floor care program. Does the customer wish to have general dust/debris control requiring a sweeper? Or is a “squeaky clean” floor indicating the need for a scrubber the requirement? Is there a substantial amount of floor debris and also the need for a "squeaky clean" floor? If yes, the customer may need a combination sweeper/scrubber machine. For scrubber applications, floor surface is of vital importance. Application surveys help reveal floor surfaces as smooth, painted, epoxy coatings, or brushed concrete. The type of debris, amount of debris to be collected, and the surface type help drive the proper machine to complete the work long term. 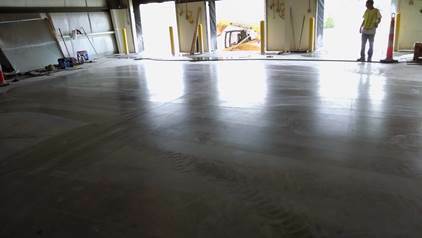 Cylindrical machines are best suited for smooth floors, whether painted or unpainted. Disc machines are best suited for rough, uneven surfaces or tile floors with deep grout lines. 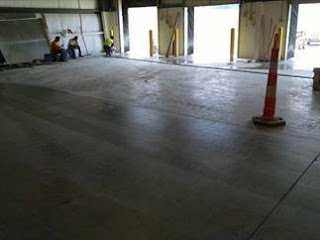 The next step is identification of the cleanable square footage of a facility, along with the aisle widths, facility obstacles, indoor and outdoor ramps, etc. These factors help to determine the right equipment size/model. Power options are to be considered as well, as models offered come in electric, LPG, Gas, or diesel powered models. At this point, customers can consider demonstration of the proper and recommended unit, and typically a formal proposal follows the demonstration. Aesthetics - companies care about the look of their facilities and want to present the right image to their associates and to their visitors. Light Reflection - brighter, well lighted facilities provide cost savings in power bills as well as safety related accidents. See here a before and after picture taken during a recent product demonstration at a customer location. Office cleanliness and appearance - warehouse areas with dirty floors can lead to dirt being tracked in the office, increasing the expense of office cleaning, and detracting from facility appeal. Employee safety - dust, debris, chemicals, and oils on the floor threaten safety due to slip and trip hazards. Employee health - dust and other particulate matter can include allergens so a clean facility improves air quality for all employees. Product acceptance - less dust and debris on stored products can lead to reduced costs and higher levels of customer satisfaction as shipped products are cleaner. Forklift maintenance cost reduction - removal of debris from floor reduces maintenance associated with repairs and replacement cost of wheels, casters, and load wheels on pallet jacks and some forklifts. There is much to consider, but very much worth the time, as these units bring great value and reduced costs for the facility for many, many years.